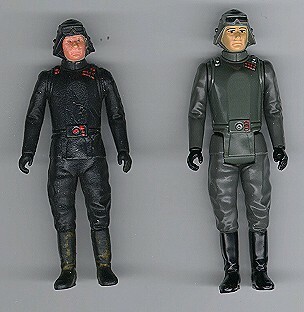 Three prominent series of Eastern European bootleg action figures were released carded during the vintage years: a Turkish Uzay line, a Hungarian line, and a Polish line. But several other related series were issued solely in loose form. These were sold in novelty shops and dime stores, at prices far below those charged for the standard licensed products. The absolute cheesiest of these figures were totally non-articulated, meaning their head and limbs were not capable of being moved. Instead, they were molded in a single piece, usually out of a hard, dense rubber material. Some of these figures utilize the limbs of Kenner's Biker Scout, a characteristic they share with the carded Polish line. I'm kind of guessing here, but these were probably released in Poland, by someone who basically bootlegged the articulated bootlegs that were then available. However, another variety of non-articulated rubber bootlegs has surfaced. These, rather than taking the limbs of the Biker Scout, are just rubber copies of standard Kenner figures. According to information provided by collector Christian Emery, several different waves of these figures were issued--some that were painted to look like their licensed counterparts, some that were molded in green or blue, and even some that were painted in metallic colors such as silver or gold. Other varieties were produced as well, as will be made evident to you as you look through this gallery; and truthfully, I don't think its prudent to try to pigeon-hole these things into systematized categories--one of the defining characteristics of the field is its utter lack of rules. Its a little difficult here sorting out what was made where, and where specifically each type of item was sold. But I've seen similar, even identical, figures come out of Poland and Hungary, so I think its reasonable to say there was some overlap. In any case, these things are fun to collect, and there's always something new to discover. This photo shows a non-articulated rendition of the AT-AT Commander figure from Kenner's Empire Strikes Back line. As you can see, its just a straight copy of the standard-issue figure, that's been made in a clunky black rubber.